Friday night my daughter and I spent doing all things water polo. Her team was dominating! So we got the late start on the games for Saturday. These tournaments last all day and you always end up eating someplace you probably shouldnt! So I though i would throw together something that would travel easy…and be healthy! Plus a few of her teammates are always starving and like healthy foods if you bring them! A few months ago I had a few bites of a raw broccoli salad that, although I typically do not care for the little raw trees, tasted great! 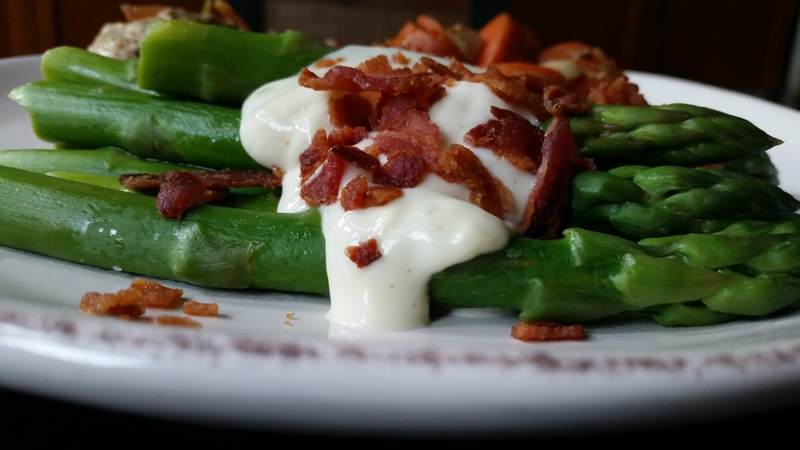 Because of a creamy little dressing with a sweet tang to it! I decided Saturday that would be my inspiration. I whipped up this salad Saturday morning and took a bucket of it to the games, where the girls devoured it! It was really good! So yesterday I did it again, and have been munching on it breakfast, lunch and dinner! I think some dried cranberries or raisins would be nice here! I broke up a handful of fresh pecans as well. Pour the dressing over the salad and toss, toss, toss. Let it mingle a while, the flavors just keep getting better….toss every once in a while. You can put it in a container with a lid and just give it a shake from time to time….keep it chilled. This morning I had it for breakfast with bacon crumbled over the top! Been Busy? Chicken in a Pot! Been busy? Yep. That’s right. That’s me. You too. But I try to think ahead sometimes! In my house it is non stop. My days are long and my family is busy doing all things all directions, so when I went Paleo I broke down and bought my very best friend, the slow cooker. I have tried many things in it, some are just great! Some are so-so….but you never know until you try! Roasts are a snap. Soups and Chilis are easy and delicious too. Yesterday I ran home at lunchtime and threw all of the items below in the pot knowing we had my daughter’s water polo game to go to after work, and it would be late when I got home, and I would probably be too tired to start cooking? yep. Start layering….I put the veggies on the bottom. 4-5 carrots, cut in 1-2 inch pieces. 3 celery stalks, cut into 1 inch pieces. Several pieces of organic, free range chicken…I used 2 breasts with skin and bones, and one boneless plus one drumstick I held out from dinner the other night. 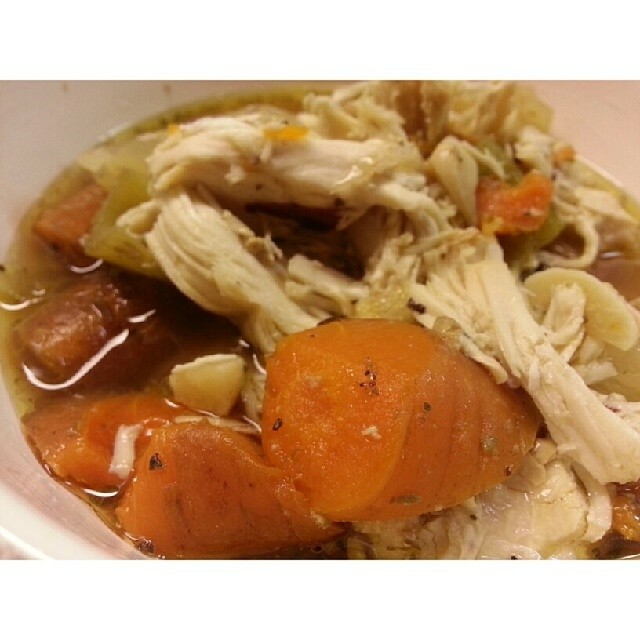 I give it a drizzle of good olive oil and a splash of chicken stock just to put a little moisture on the bottom of the pot…the slow cooking will create a full pot of “juices” as your soup cooks! PUT THE LID ON….and set it to go for 6-8 hours on low! Easy easy easy….leave it and come home to lovely smells and a delicious meal….and it is so good for you! PLUS! Leftovers for the next day! SWEET! And now a word from my Mother! My mother sent me a pic of her breakfast last weekend…she does this from time to time…and it always looks amazing so I post it on instagram and everyone loves it and it gets way more likes than anything of mine, whatever! She is paleo, she will not let me tell her age, but I am 43, and she gets discounted movie tickets! So that is all I have to say about that except how cool is it that she GETS it! She is holistic, organic, natural and paleo! 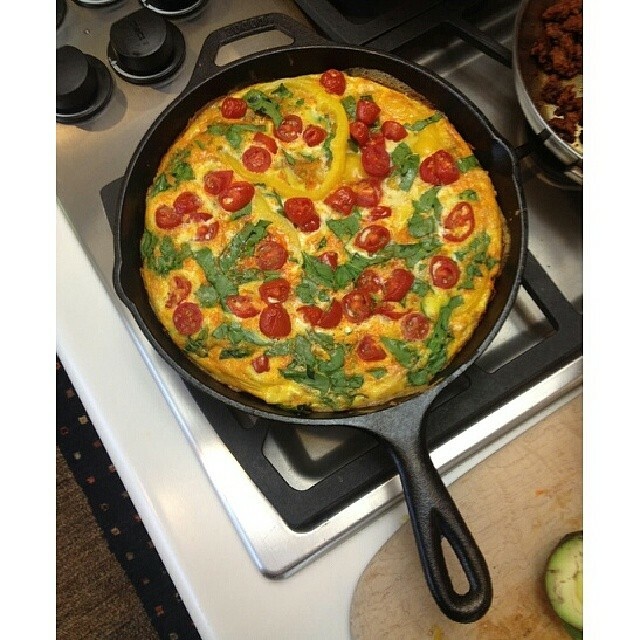 And because everyone on IG wanted to know, here is her recipe for the fritatta above, and her guest post….so, mother….you are on the internet now! you famous! wanting to make the Sunday morning frittata. Or try for dinner on a busy day. Aren’t they all? Most time consuming thing is grating the sweet potato. “What?” you say. Recipe coming up and it is very healthy! I have a little farm where I grow some of my own vegetables and herbs. Love that and of course we do it organically ! a la my farm garden. the oven does alot of the work for you…..and fast! Heat the oil in an oven safe skillet over medium heat. Add the sausage, sweet potato, yellow pepper, and onion and sauté apx. 5 min. Place the frittata in the oven and bake for 12 minutes. **I would add some “smashed garlic with sea salt”, we tend to thrive on alot of garlic! And if you like hot peppers, I would do either of the next suggestions for a little “tickle” for your taste buds. Just chop one hot pepper, could be cayenne, our personal favorite that we grow, or jalapeño or a small Tai pepper. I seed them mostly and chop finely with sea salt. Add 8-10 sliced grape tomatoes. Toss some of this on each slice of the Frittata. Or do all of the above except sauté with 1 teaspoon grass fed butter or oil in a small skillet for a minute and then add 1/4 to 1/2 cup of full fat coconut milk or unsweetened almond milk and stir till thickened slightly. You can add some(grass fed) grated cheddar to this or just spoon it as is over… anything really. Just delicious! Oh! Don’t ever breathe over a skillet with hot peppers cooking or you will choke a bit and or sneeze, depending on your particular physical make up. Experience is our teacher, right? I think it took me longer to write out the recipe for you than it did to make it. So, hope you try this, it will work for any “busy girl for a paleo world”. Ok so first, clearly I am obsessed with blueberries right now. I eat them like a sugar junkie on jelly beans. The are so juicy and sweet right now, I almost cannot stand it! Cheap they are not, but mighty tasty and really good for you, so I splurge! 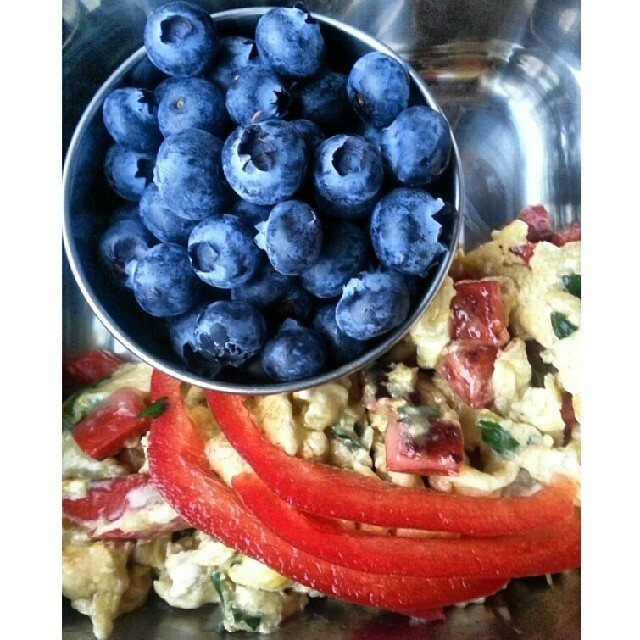 Blueberries are showing up along my breakfast, as a snack and trailing through my salads. I just cannot get enough right now! This morning was a blur in my house as usual. The daily scramble to get yourself dressed and ready for work along with a few household items (washer, dryer) dogs and cat fed and watered and let out…always leaves me barrelling out the door in a rush no matter what time I get up! I kind of like it, but I don’t like running late, and that does happen. Thankfully there are alot of quick ways to throw breakfast together….I usually pack mine and eat it at my desk when I can breathe a little! A red pepper was calling my name from the fridge, and bacon was not. I put a bit of Kerrygold butter in a small skillett to melt over medium heat. Quick chopped about a fourth of a RED PEPPER…tossed it in the pan. While that is cooking, crack two eggs into a bowl and chop about a teaspoon of fresh PARSLEY – add that to the egg. Beat the egg with a fork with a dash of salt and pepper. Pour into the skillet and start moving the eggs and peppers around as it scrambles. You can give a quick sprinkle of grated Kerrygold Cheese over the eggs if you like, or dice some tomatoes or avocado over the top….but today it went as is into the container…. So easy, so fast….so good! All right, one last one for today. Lunch kind of just happened today, but happened really well! So, I posted earlier about a little cucumber veggie salad that I like alot made with chopped veggies, mayo, Sunny Paris Seasoning, fresh garlic, S&P and a little vinegar. Well, the nice thing about that mix is it gets better as it sits, and I had a little (very little!) left over last night, and I kept it! 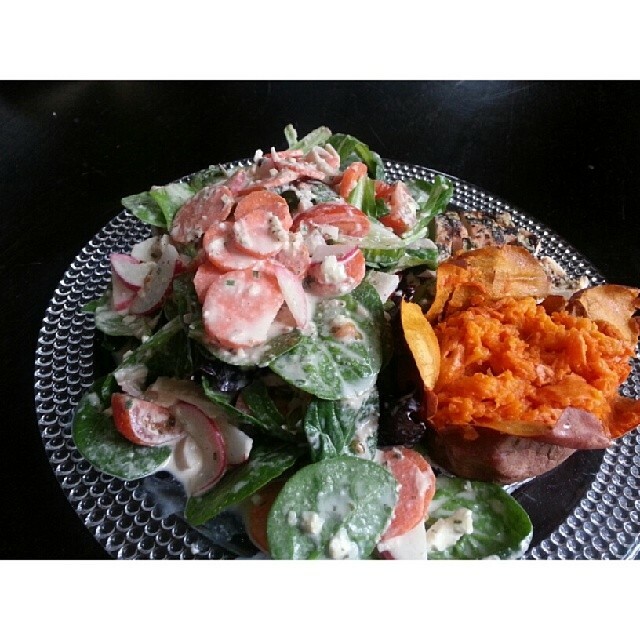 I decided to make a salad at lunch and a sweet potato and a little leftover grilled chicken. I just made a salad with spinach and lettuce leaves. Added a little more veggies (more radishes, carrots, a stalk of hearts of palm) and a tiny bit of organic feta cheese (goats). I hit the whole bowl with a small dollop of mayo, a little more vinegar, and dumped the remainder of last nights salad on top! mix mix mix . wow and WOW! look at that plate! I sort of went into a trance while I was eating away, ended up not even eating much of the chicken and of course devoured that tater! So this I guess is kind of a recipe? 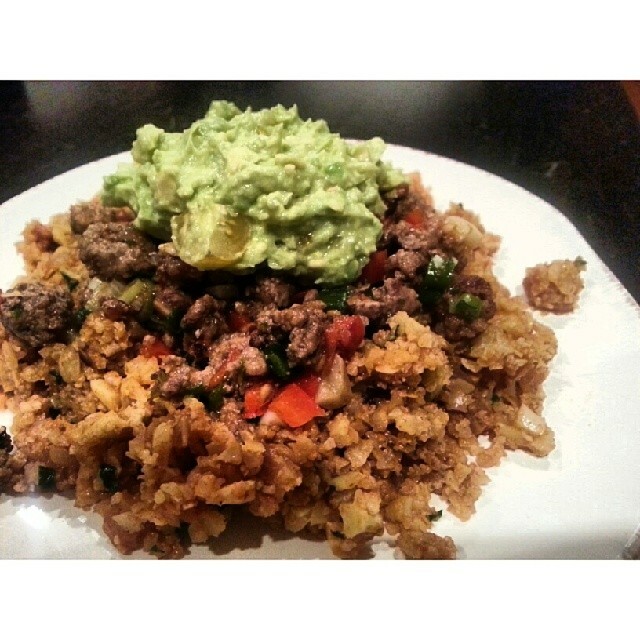 More of a guideline of how quick and easy paleo lunches can be! Keep easy things on hand like leftover proteins, lettuce, fresh organic veggies, and a fresh jar of your home made paleo mayo at all times! Hope you like my pretty plate, I know I did! 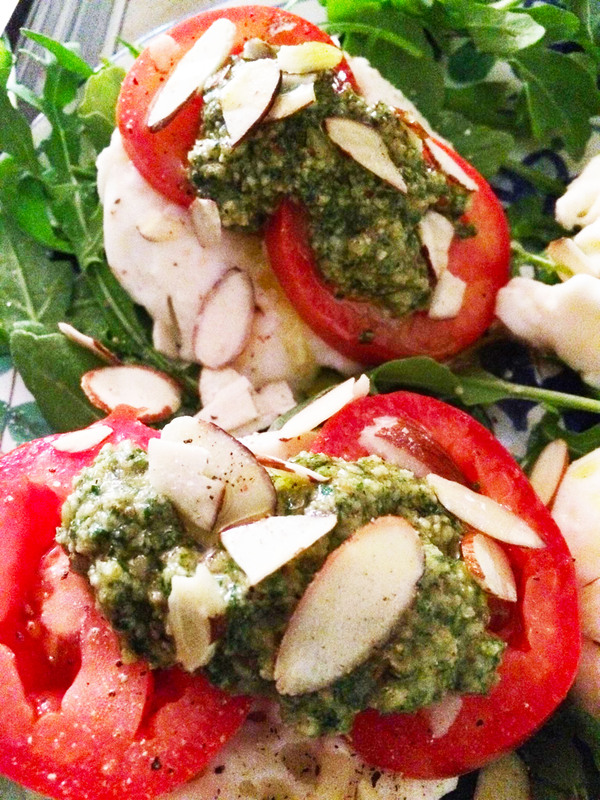 So this salad is too easy not to try, and there are so many variations you can make it your own! I actually had this one published in Paleo Magazines Reader’s Choice Cookbook! I have a soft spot for broccoli! 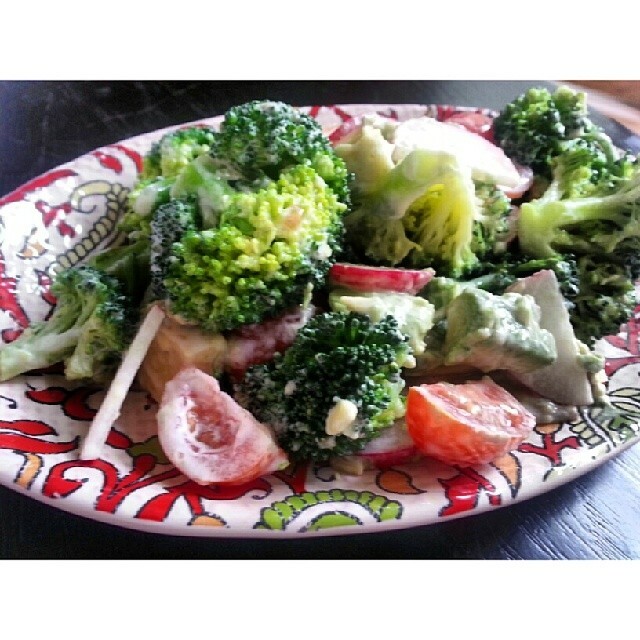 Broccoli is always the base for this salad for me. And avocado (but I didn’t have any on hand that day…wah!). Bring a pan with about an inch of water in it to a boil. 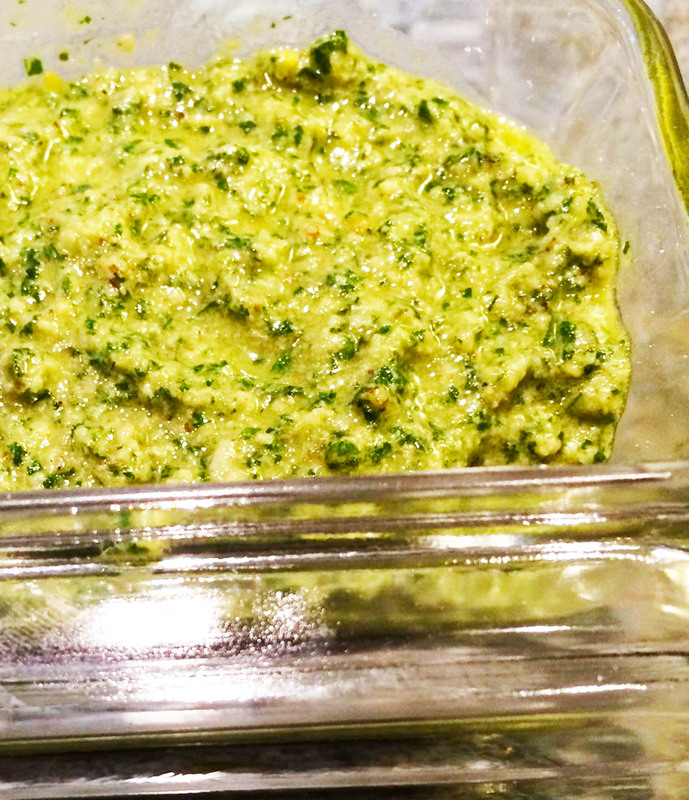 Throw in a large handful of broccoli florets and let them cook about 2-3 minutes….you do not want them to get mushy! 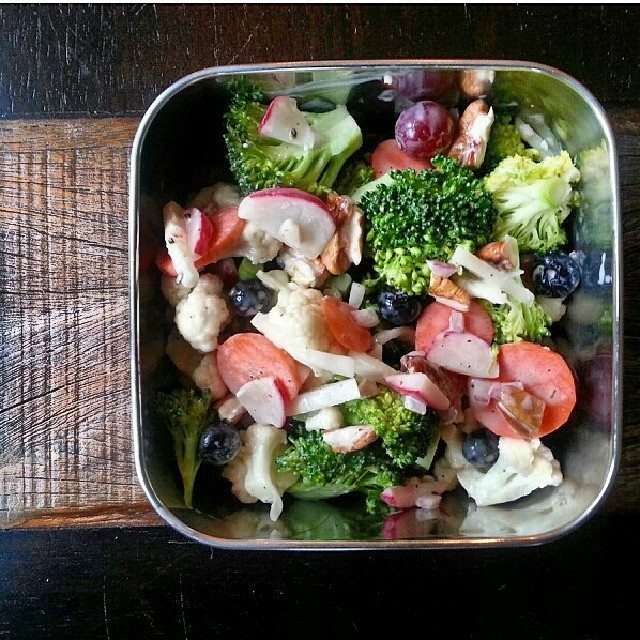 Chopped veggies! Tomatoes, radishes, cucumbers, carrots, avocadoes, celery…whatever catches your eye that day! Strain and drain the broccoli…then dump out on a paper towel to catch the last bits of water. Then add those to the bowl. Into the bowl with a big spoonful of homemade mayo, salt and pepper to taste, and squeeze lemon juice all over it…then toss, toss, toss. A spoonful of mayo and this time I shook some light raspberry vinegar over the top…maybe 3 tablespoons? toss and mix and toss….the longer it sits, the better it gets! So delicious I just cannot say enough about these two easy salads that are so different every time you make it! 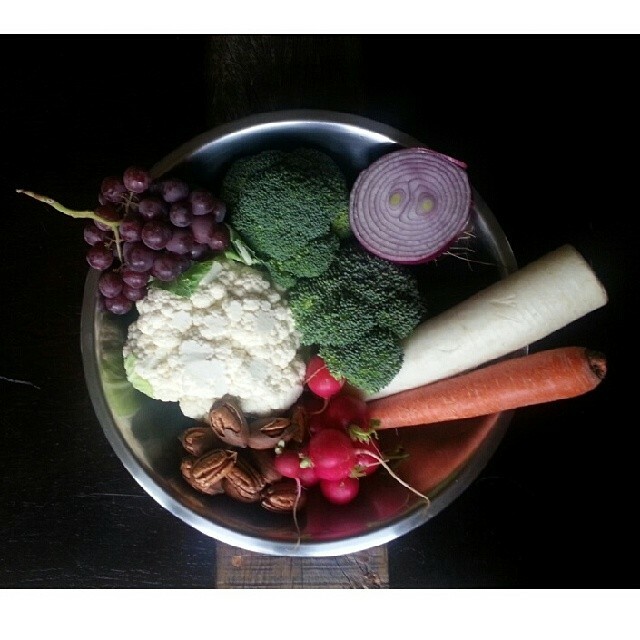 I am a huge fan of Michelle Tam of http://www.nomnompaleo.com and book, Nom Nom Pale, Food for Humans. She was the first paleo blogger I found when I did my first Whole 30 about two years ago. I loved all of the things she made and the fact that she is a mom of two boys and works full time and seems to truly love food! Everything I have ever made from her blog or book has had such depth of flavor, just amazing food! 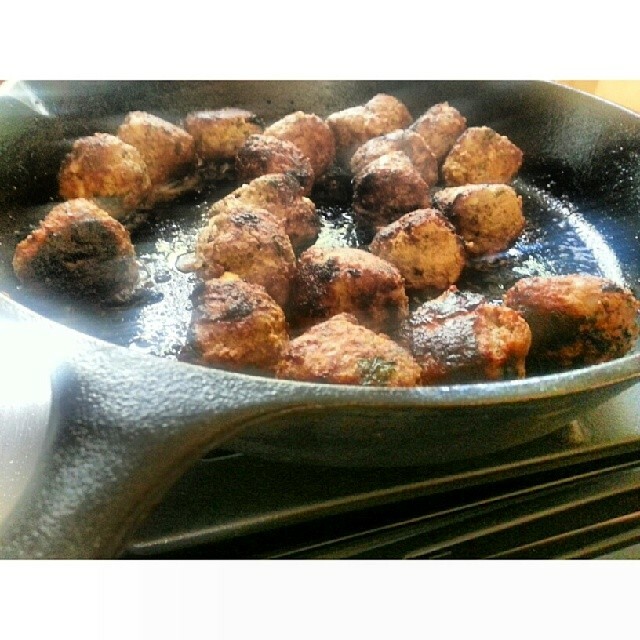 Well, I had a pound of ground meat on hand and wanted to make one of her meatball recipes, but she used veal, and seasonings that lended themselves to veal like basil. I had beef…so I ran with that using her recipe as a base to stem from. They turned out light and airy and so flavorful! Shape into golf ball sized meatballs. Brown in a good skillet over medium-hi heat in a mix of ghee or butter and coconut oil for 2-3 minutes per side, keep turning until browned all over. You can sauce these up so many different ways or just eat on their own! Easy stuff! We ate with the remainder of the cauliflower mash on the side and a chopped veggie salad.